Unusually, my first encounter with Hamish MacCunn was not with the ubiquitous overture The Land of the Mountain and the Flood. Many years ago I discovered an attractive Valse (from Two Dances for piano, 1912) by this composer who appeared to have a name straight out of Sir Walter Scott or John Buchan. At that time, I had been reading Buchan’s novel Huntingtower, written in 1922. This book featured a Glaswegian detective with the improbable name of Dickson MacCunn, so the surname at least was familiar. I looked up ‘Hamish’ (Gaelic equivalent of James) in Grove at the Glasgow Mitchell Library and discovered that he was a Greenock-born composer: like me, he was a Clyde-sider. It was not until a couple of years later that I came across the recording of Sir Alexander Gibson (HMV ASD 2400) conducting the legendary overture and then heard it regularly on television as the theme tune to Sutherland’s Law (1973-76). Since that time there has been a major retrospective of MacCunn’s music from Hyperion (CDA66815), another CD dedicated to his part-songs and a number of minor works included in various recitals. This reflects my total listening experience of Hamish MacCunn’s music: I imagine that this is the case for most enthusiasts of British music from the ‘long nineteenth century’. Jennifer L. Oates’ Hamish MacCunn (1868-1916): A Musical Life serves a number of important purposes. Firstly it successfully presents the life and works of the composer in largely chronological order. Secondly, the book situates MacCunn’s achievement in the context of the first stirrings of the so-called English (British) Musical Renaissance led by Parry, Stanford and Alexander Mackenzie and soon to include composers as diverse as Elgar, Vaughan Williams, Frank Bridge and eventually Britten. Finally, there is a detailed examination of the influence of ‘Nationalism’ and of things ‘Scottish’ or the ‘Celtic Twilight’ on the composer’s achievement and ultimate disappointment. The significance of this book is enhanced with a complete catalogue of MacCunn’s works, an extensive bibliography and detailed indices. A few biographical notes about Hamish MacCunn may be of interest. He was born at Greenock, Scotland on 22 March 1868. His father was a wealthy ship-owner and his mother Barbara had once studied piano with William Sterndale Bennett. After much musical encouragement at home, MacCunn headed down to London to take up an open scholarship at the Royal College of Music, aged only fifteen. He studied with Hubert Parry and Charles Villiers Stanford. He did not gain a degree there as he resigned the course, unimpressed with the qualifications, the teaching (except Parry) and the attitude of the staff who snubbed him socially. His first major performance was at the Crystal Palace in 1885 with the ‘Cior Mhor’: Overture (now lost). He built on this success with three further orchestral overtures or ballads based on Scottish topographical or literary themes: the well-known The Land of the Mountain and the Flood, Op.3, TheShip o’ the Fiend, Op.5 and The Dowie Dens o’ Yarrow, ballad, Op.6. The same period saw performances of the cantatas Lord Ullin's Daughter, Bonny Kilmeny, The Lay of the Last Minstrel and The Cameronian's Dream. In 1888, aged twenty, he was appointed Professor of Harmony at the Royal Academy of Music. The following year MacCunn married the Scottish painter John Pettie’s (1839-1893) daughter, Alison. In 1889 the Carl Rosa Opera Company commissioned the opera Jeannie Deans which was first performed in 1895. This was followed by Diarmid in 1897, which was not a box-office success. In 1898 he became conductor with the Carl Rosa Company and also held posts with the Moody-Manners and Beecham companies. MacCunn taught composition at the Guildhall School of Music from 1912 until his early death on 2 August 1916, aged only 48. Hamish MacCunn’s romantic-sounding music, which also includes songs, part-songs and piano pieces, owes much to Mendelssohn, Grieg, Dvořák and Wagner in its style. The earlier works are marked by a considerable use of Scottish literary themes and musical devices. Later compositions tended to explore a wider range of inspiration, but towards the end of his life MacCunn began to rediscover his Celtic roots once more. 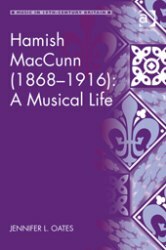 Hamish MacCunn (1868-1916): A Musical Life fills an important gap in the history of British music. Readers have been overwhelmed with volumes dedicated to exploring every detail of the life and times of Edward Elgar. Fewer books have been written about Parry and Stanford; however their accomplishments have been re-evaluated in recent years. The group of Scottish composers who feature in the ‘renaissance’ have been largely ignored. There are no studies in print (a few theses have been published) examining the achievement of Learmont Drysdale, Frederic Lamond, Alexander Mackenzie, William Wallace, Hamish MacCunn and John Blackwood McEwen. An examination of the literature concerning Hamish MacCunn is telling. Until 2013 there had been no major study of this composer available in print. Historically most of the references to him had been chapters or notices in books, articles and newspapers. The earliest substantial reference appears to be J. Cuthbert Hadden’s article ‘Scottish Composers and Musicians: Hamish MacCunn’ in The Scottish Musical Monthly (December 1893). This is not cited in Oates’ bibliography. The first formal notification is in the Brown-Stratton British Musical Biography (1897) and later in the second edition of Grove (1904-10). The first major essay is Janey Drysdale’s 'Scottish Composers: Hamish MacCunn' The Dunedin Magazine ii no.2 (March 1914) which was based on notes provided by the composer. Substantial references to MacCunn appear in Farmer’s A History of Music in Scotland (London, 1947/1970), and John Purser’s Scotland's Music (Edinburgh, 1992). Other good sources of information include George Bernard Shaw’s collected music criticism and A.M. Henderson’s Musical Memories (Glasgow, 1938). It is surely just a coincidence that 2013 also saw the publication of Alasdair Jamieson’s The Music of Hamish MacCunn, Author House, UK Press. This is based on his thesis published in 2007. The basic plan of this book is quite straightforward. The chapters are presented in largely chronological order. After an important introduction there are sections on MacCunn’s early life and musical achievements in Greenock leading to his move to London. It is facile to divide MacCunn’s career into ‘periods’ however it is convenient. As noted above, the London years between 1887-1890 were largely devoted to the orchestral works and a number of important cantatas, all based on Scottish themes. For the next five years he was engrossed in his two major operas, Jeannie Deans and Diarmid which forms the basis of chapters 3 and 4. It is a generalisation, but not far from the truth, that by the time he was thirty, most of his important compositional achievement was complete. The last two chapters deal with his later works and his career as a teacher and conductor. In this last period, MacCunn’s music expanded into areas not directly inspired by the ‘Celtic Twilight’. The main text concludes with a chapter entitled ‘The Potential Saviour of Native Music: Appraisals and Conclusion’. This book is not simply an examination of Hamish MacCunn as a composer. A great deal of effort is put into exploring his important contribution as a teacher and a conductor. For example, a number of pages are devoted to the part he played in promulgating a Scottish College of Music which did not find fulfilment until some years after the composer’s death. Musical historians wishing to investigate the various stylistic and social trajectories implicit in late 19th and early 20th century music will find that Jennifer Oates’ book supplies useful tools to help understand the place of Scottish art-music as seen through the prism of a London-based musical culture often centred on South Kensington and the Crystal Palace. This detail will be of considerable interest to cultural and political historians of the period. Finally, the wealth of musical examples and analysis will be helpful to performers who may be encouraged to take up Hamish MacCunn’s music in the 21st century. Looking at Jennifer Oates’ exposition of The Ship o’ the Fiend gives a good idea of the detailed but not forbiddingly technical analysis of the music. She begins by comparing the work’s ethos to that of the Mountain Flood. The earlier work is largely ‘painted impressions’ of the Scottish landscape whereas The Ship tells the tale of the old Scottish ballad ‘The Daemon Lover’. She outlines the plot of this story, originally printed in Walter Scott’s Minstrelsy of the Scottish Border. She relates this imagery to the genre of tales that tell of a man returning from the dead to reclaim the woman he loves. The actual version that inspired MacCunn was found in Allingham’s Ballad Book (1887). Oates then draws some similarities with Tchaikovsky’s Romeo and Juliet Overture. After a largely descriptive analysis of the music, she cites a number of early reviewers who had mixed opinions about the work. Bernard Shaw ‘did not care for the overture’ but the Monthly Musical Record was impressed by this ‘powerful piece of tone painting’. There were contemporary suggestions that MacCunn should now turn his hand to ‘abstract music’. It is an impressive study of an excellent piece. I was pleased that she did not become highly technical in her discussion and indulge in detailed ‘Schenkerian’ analysis of this work. This would have spoilt the broad-based, but essentially scholarly, musico-historical appeal of this book. Hamish MacCunn (1868-1916): A Musical Life is a well-produced book which is typical of Ashgate. The paper quality is good, the binding is strong and the font is clear and readable. I am pleased that footnotes rather than endnotes have been provided. I always read them - or at least glance at them - so I am grateful for not constantly having to turn to the end of the chapter or book. The ‘scholarly’ nature of the argument requires many footnotes with these often taking up more than a third of a page. A selection of rare photographs has been included in the text rather than as a separate section of plates: this does mean a diminution of quality. There are a number of tables illustrating the structure of some of the music. Many musical examples are given throughout the text and these are clear and helpful in following the development of the musical analysis. Finally, there is an essential list of abbreviations presented at the front of the book that covers ‘special collections’, ‘journals and newspapers’ and other frequently quoted sources. This is especially useful bearing in mind the considerable number of references to manuscript material given throughout the volume. An essential part of this book is the ‘exhaustive’ catalogue of Hamish MacCunn’s ‘Complete Works’. Oates has wisely chosen to present this by genre and then chronologically within the genre. I again take as an example the less-well known tone-poem The Ship O’ the Fiend. This work was assigned Op.5 by the composer. The manuscript (MS 3365) is dated 18 June 1887 and is deposited at the National Library of Scotland in Edinburgh. The date of publication by Augener is not specified in this present listing: Jamieson and World Cat give it as 1890. No mention is made here of the important new version of this score (along with Mountain Flood and Dowie Dews edited by Jennifer Oates in 2010). The dates of the Fiend’s premiere, 18 February 1888, at the Crystal Palace and the first Scottish performance on 24 December 1889 are cited. Interestingly, Jamieson (2013) writes that the premiere was at St. James’ Hall, London on 21 February 1888. I found a reference in the Morning Post (16 Feb 1888) advertising The Ship o’ the Fiend (first time of performance) at the St. James’ Hall as Jamieson stated. The review in the contemporary Musical Times seems to confirm this date. Oates does not give the orchestra or conductor - in this case the London Symphony Orchestra conducted by the composer. It would have been helpful to have given orchestral ‘scoring’ and the source of the text, although this latter is noted in the analysis of the work. Other versions of this overture were produced including an arrangement for piano duet by Marmaduke Burton and one for string orchestra by Adam Carse. These are not noted. The ‘Select Bibliography’ defies the adjective in its title. Running to some 17 pages of close text this is conveniently divided into three sections: ‘Manuscript Sources’, ‘Printed Primary Sources’ and ‘Secondary Sources’. There can be little that has been written about Hamish MacCunn that is not detailed here. I was disappointed with the Discography. I would have expected this to have been presented by ‘work’. What Oates has done is to list all the CDs (no other media) that have been released featuring Hamish MacCunn’s music. She has not stated what particular work(s) have been recorded. So for example, Seriously Scottish: Music from Contemporary Scotland published by the Scottish Arts Council in 1999 has Effie’s beautiful aria ‘Sleep for the day is done’ from Jeannie Deans alongside 38 other tracks by a diverse group of other musicians including folk and rock. The reader is required to search the internet to find out what has been recorded on each disc. Alasdair Jamieson has not included a discography in his book, however, there is a brief listing given in his thesis. The book concludes with an excellent index which includes comprehensive references to MacCunn’s life and music. Jennifer Oates is a musicologist who specialises in 19th and 20th century music. She is currently Associate Professor at Queen’s College and the Graduate Centre CUNY and is also Head of the Music Library at Queen’s College. Oates has a particular interest in Scottish art music, Granville Bantock and the present composer. She has produced a scholarly edition of the three surviving MacCunn overtures and is working on an edition of his songs. There is an important contribution about MacCunn in Ashgate’s Europe, Empire and Spectacle in Nineteenth-Century British Music (2006): her work will be featured in a fascinating-sounding collection of essays entitled The Sea and the British Musical Imagination which is forthcoming in 2015. I am not quite convinced by the conclusion that the main reason that MacCunn ‘failed’ was that he refused or was unable to respond to the currents of modernism that were raging in the musical world in the Edwardian years at home and abroad. I concede that MacCunn’s compositions are largely based on the success of the ‘romantic’ overtures and cantatas of his early years. I do not believe that it is always valid to judge a composer by his or her reaction to passing fashions and fads. MacCunn’s music is impressive, colourful and evocative of a long-past era. Those works that I have heard are fine examples of their genre. This book is a significant study of McCunn’s life and career. Ms. Oates has produced a comprehensive examination of the man in all his guises - teacher, opera conductor, composer, protagonist for the re-awakening of Scottish art music and family man. The author has not produced a ‘hagiographical’ study, but has presented the man in his complexity. The fact that he did not achieve his ambition to become the ‘Saviour of Native Music’ is not avoided. The analysis of music plays an important, but not top-heavy part in this text. Alasdair Jamieson’s book concentrates on MacCunn’s music, whereas Jennifer Oates has majored on the cultural milieu of the composer’s achievement. Readers who are fortunate enough to possess both Oates’ and Jamieson’s books will be inclined to compare the relative merits. These two books are complimentary rather than competitors. However, for a detailed assessment of Hamish MacCunn’s entire musical and personal achievement, Jennifer Oates’ book is the place to start.